Authors, Kai Strand & LA Dragoni: 5 Books With Covers That Screamed "READ ME!" My talented and generous critique buddy, Mary Waibel, has her review of Finding Thor on her blog. Please hop on over to Waibel's World and see what she has to say about my young adult romantic suspense releasing Thursday! So, this week I’m talking book covers. I admit, I have been known to judge a book by its cover and while browsing Goodreads, or maybe Amazon, recently I noticed that purple seems to be the new black. So many pretty book covers whose color schemes revolve around purple. At first I wondered if I was simply noticing the purple covers because Finding Thor’s cover is in purples, but so was Beware of the White, and I didn’t notice them then, so I'm going out on a limb and declaring a trend. The Dark Divine – I love the stark legs in the vulnerable pose against the black background. And I really love the flowing material. Eye catching contrast. Gives motion. Increases the feeling of vulnerability. They continued the theme through the series. Gorgeous covers. Silver Phoenix – An Asian girl, standing in a strong pose, wearing a bright fuchsia kimono. Yes, please! Without even reading a blurb I know I’m going to get strength of character and culture. Bunheads – I love the pretty, geometric design made from ballerinas. I know, sometimes I’m such a girl! 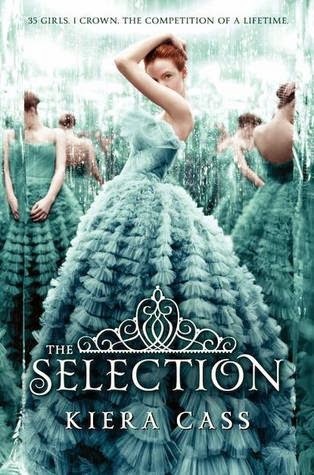 The Selection – Speaking of being such a girl – the dress! It got my attention immediately. The pose intrigued me. I loved the mixture of shy and flirty. Another series that successfully carried the theme throughout. Ghostopolis – Such a cool looking world. A boy sitting on the skeleton of a horse. I had to know what the heck was happening in this story. Not all books have the opportunity to capture my attention simply with their covers. Being an author with my ear to the ground, I often know too much about a book before seeing the cover. However, when the opportunity arises, those were some of the things that captured my attention when I was exposed to a book for the first time through its image—enough for me to pick it up and read. What about you? What covers captured your attention? I love The Dark Divine. The black and purple are gorgeous! 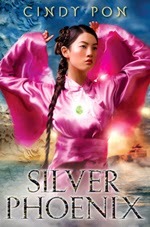 I love the cover for Silver Phoenix by Cindy Pon. It's one of the reasons I pre-ordered the hardcover before the book was released...so gorgeous! I was randomly looking through a bunch of covers just the other day. As I mentioned on Twitter, the ones with knives or daggers on them kept jumping out at me. There are certain elements that always capture my attention, even if the cover is only so-so. Like dragons. I'll always take a second look at a dragon. Silver Phoenix was a good book too. The food in those books! Man she can write good food!